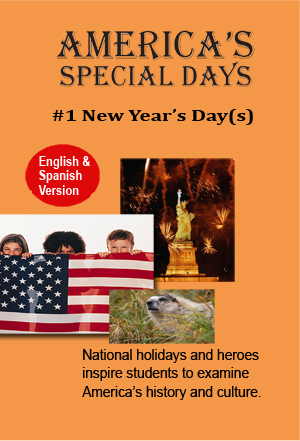 America’s Special Daysand Francesca, our guide, take us to several locations where people are celebrating New Year’s Day in a variety of ways. She explains how the calendar was developed, and briefly describes the solar and lunar calendars. The dropping of the lighted ball in New York City, “Auld Lang Syne” and street celebrations are shown as traditional ways to celebrate New Year’s Day. The Chinese New Year celebration is also shown, depicting the dragon as a symbol of goodness and strength. Francesca concludes the program by writing a New Year’s resolution and challenging the audience to make and keep their own resolutions.